This blog post is contributed by Ian Wright and his colleagues from the Ptolemy team. Interestingly, this unplanned opportunity presented itself on 12 November 2014, when Philae landed not once but three times on Comet 67P/Churyumov-Gerasimenko. The Ptolemy instrument on Philae is a compact mass spectrometer designed to measure the composition of the materials making up 67P/C-G, with a particular focus on organic molecules and mineral components. Earlier in 2014, Ptolemy had collected data at distances of 15,000, 13,000, 30, 20, and 10 km from the comet, while Philae was still attached to Rosetta. 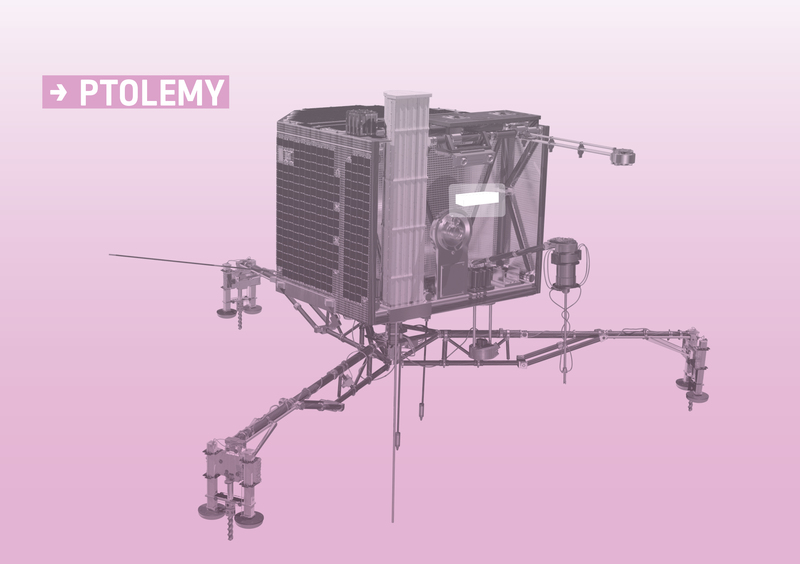 But from 12 to 14 November, along with some other instruments on the lander, Ptolemy had the chance to operate at more than one location on the comet’s surface. 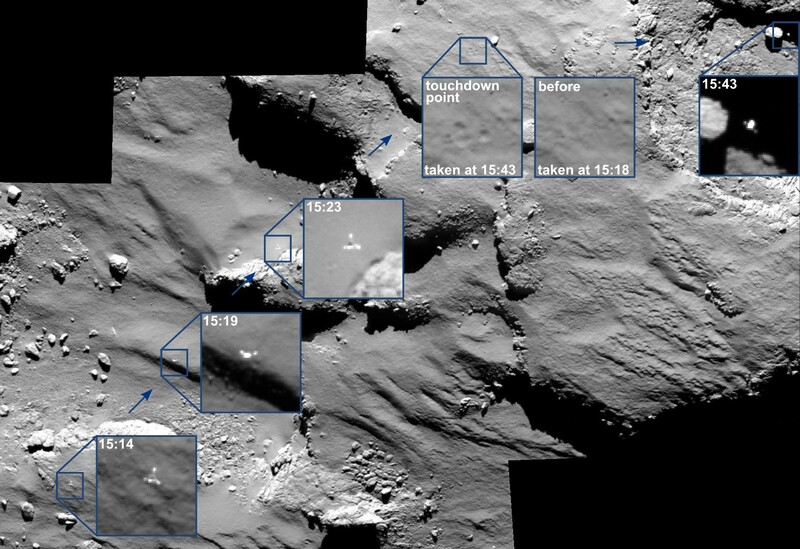 Ptolemy performed its first ‘sniffing’ measurements on the comet just after the initial touchdown of Philae. At almost exactly the same moment, the OSIRIS camera on Rosetta was imaging Philae flying back above the surface after the first bounce. Later, once Philae had stopped at its final landing site, Ptolemy then made six subsequent sets of measurements, sniffing the comet’s atmosphere at the surface between 13 and 14 November. Finally, a slightly different experiment was also conducted on 14 November, which was completed only 45 minutes before Philae went into hibernation as its primary battery was exhausted. For this “last gasp” experiment, the team used a specialised oven, the so-called “CASE” oven, to determine the composition of volatiles (and perhaps any particulates) that had accumulated in it. The Ptolemy team also used the same opportunity to reconfigure their analytical procedures, to see if they could make some isotopic measurements. Unfortunately, there was no chance to use Ptolemy in conjunction with SD2, as this was confined to the sister instrument, COSAC, given the limited power and time available. The experiments conducted by Ptolemy on the surface of Comet 67P/C-G. Table courtesy of the Ptolemy team. Because of the relatively high power consumption of Ptolemy, it was a race against the clock. The battery had to hold out, both to perform the measurements and to relay the data back to Rosetta and then home. For those involved, it’s hard to describe the shared emotions on that day, helplessly watching a voltage heading towards the end-stop. 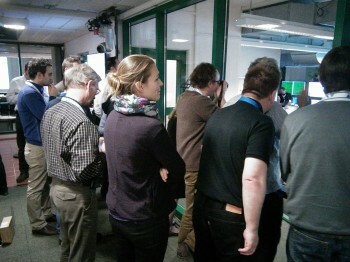 Scientists from the Ptolemy team at the Lander Control Centre at DLR in Cologne, Germany, during the night between 14 and 15 November 2014, just before Philae went into hibernation. Photo courtesy of Ian Wright. Nevertheless, the very good news is that Ptolemy definitely returned data from its various stops on the comet. However, the data are complex and will require careful analysis: this will take time. Also, because the instrument was operated in ways that hadn’t initially been planned for, it will be necessary to go back into the laboratory to run some simulated tests, to ensure that the on-comet data obtained in similar configurations can be understood. In the first instance, however, the team will be concentrating on the data acquired immediately after the first touchdown. It will be fascinating to compare the rich spectrum of organic compounds detected by Ptolemy with the measurements made by COSAC about 14 minutes later. The Ptolemy team has lots of questions. Exactly what organic compounds are present and in what ratios? How did things change between the various sets of measurements? What does these data tell us about the composition of the 10–20 cm depth of surface dust that got kicked up during the first bounce? And what can these materials tell us about the fundamental make-up of comets? The team is looking forward to making these analyses over the coming months and sharing the results with you. Ptolemy Principal Investigator: Ian Wright, Open University, Milton Keynes, UK. Wander what lies in the plural form mass spectra? E.g:275 mass stectra. That’s latin plural, preserved from times when the science spoke latin. 😉 yes. But how is “275 mass spectra” to be interpreted? “…Ptolemy then made six subsequent sets of measurements”. To much ignorance [and lack of attention] on my part. The mass spectrometer works in discrete steps, and to aquire one spectrum it needs a certain amount of time in order to perform all the required operations (sampling, sample ionization, etc.). Thus in 40 minutes the mass spectra of 275 samples was recorded. For more info on how Ptolemy works look in inet for “PTOLEMY – AN INSTRUMENT TO MEASURE STABLE ISOTOPIC…” article. Language is difficult. It almost becomes clear to us mortals, but because you say ‘spectra … WAS’ (plural/singular) we still remain in the dark. Is it true that: “In 40 minutes, 275 samples were taken. From each sample a mass spectrum was computed. In order to obtain reliable data, the average mass spectrum was subsequently computed”? Would that be the proper interpretation? …and very pleasant it is to see it. Glad to see a Team that is longing for getting something done. When they present their result i hope that they will turn their faces to the camera. Wish them any luck needed and good hunting. It seems to me that this is the first time that informtion regarding the presence of water (and thus ice) is released (I’ve been following the blog, and I don’t remember having seen a reference to it). There was speculation about the nature of the surface material as being solid ice covered with dust, given the bounces of Philae’s, but I was lacking this much more clear information. Now the question remains on the nature of the inner structures of the comet that result in a density so much lower than ice: could sublimation and degasing of the ice generate a porous, snow-like, material in the inner layers of the comet ? Back to the “dirty snow-ball” model? And what about the rock-looking features of the comet surface? Another strange aspect is the low organic material content in the final location, while in the first touchdown that was abundant. This could hint that the powdery “plains” (from teh first touchpoint) are made of snow and organic volatiles, much more likely to degas, whereas the “rocky” edges of the craters (and possibly the boulders) are harder and more solid ice features, that are less likely to sublimate and, specially, less prone to capture those organics – or at least to liberate them. You are all brilliant, but I can’t understand where the spaceship is, what is it doing, and if there’s water on the comet. Meanwhile, Philae is hibernating on the surface of 67P/C-G; it’s final touchdown site has yet to be confirmed. “To be confirmed”? Does it mean there’s already something stronger than a hint, or an área…? Keep us updated, Emily, please!!! “12 Nov…water and rich in organics” is very interesting! Thank you for posting this update, looking forward to reading more. Good luck with the lab simulations. So the flat, dusty surface of initial contact is rich in organics – the ice is sublimated away and heavier dust has collected under microgravity. The cold, hard, shady spot is all ice. A density of about 0.4 g/cm3 may indicate a large presence of methane (ca. 0.5 g/cm3 as a solid) beside water – thus methane being the first organic “suspect”. We can further speculate on the presence of solid nitrogen – needed to form species as HCN and HNC nicely mapped in comet come by the ALMA’s group in August. AFAIR the surface of the comet is quite black (low albedo); looking to carbonaceous chondrite such as Murchison meteorite, the presence of tar-like and other complex organic species (including some PAH and/or aminoacids) is also likely. Really interesting is the ratio of carbon-13 and carbon-12 which can be definitely seen in an MS spectra. Congratulations the Ptomely team!! So glad to know Ptolemy worked really well. Pity for the one with SD2 but it’s a kind of part of an exploration to unknown world. Hope Philae will wake up and you get data at the time the comet gets more active. Good Luck!! So many questions from so many persons but no answers gives a new meaning to “absolute vacuum”. I know that there is at least a one hour turn around time for communication with the lander but still it surprises me that the lack of eagerness to do proper experiments is present. The default command set started at touch down and then it took over 14 hours to sniff again. 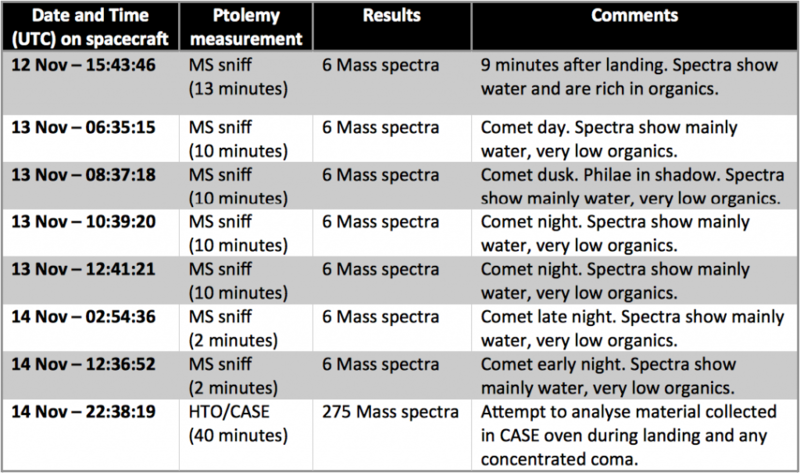 We had a blog where the smell of the comets outgassing was described as it would stink. A lot of things stink on this mission and its not organic or inorganic chemistry i am talking about. remember what is measured is the contents of the “atmosphere”, which precludes substances that are tied to surface either because no dust is there to be whirled up by Philae or because those (organics) have a sublimation point beyond the prevailing temperature. I.e: the black rock i full of organics, but they stay there unless the drill can be operated to success. Jacob: But there was a second touchdown (after the graze), so if there was less dust to be whirled up, then there is some distinction being made between the dust and the rock. What I am hinting at is that particles -in dust whirl-up -not volatiles, have been detected. Hi Jacob. That would be my conclusion. Ptolemy was said to have “sniffed” the atmosphere each time until the last experiment. The second reading was done nearly 12 hours after the final touchdown, when you would think all the “dust had settled” as it were. Philae is in a cold mainly dark alcove, but it would seem either, some sublimation occurs at a low level continuously, or due to the cold dark environment the gas pressure is insufficient for the amounts of Water sublimating in the couple of hours of sunlight in the alcove, to escape the locality and it just sits there as mist. Maybe Matthias’s fog is not just artistic licence. The organics are most likely bound to silicate minerals and dust. As I understand the process, the dust is required to give a catalytic effect to the UV and Cosmic Ray powered organic synthesis reactions. Experiments in the lab show an analogous mixture of volatile ices does not go dark when exposed to UV and electrical discharges, but if a cosmic dust analogue is mixed in the formation of dark coloured organics does occur. This assortment of organic compounds were given the generic name, Tholins by Carl Sagan and Bishun Khare. There are two types of Tholins, those produced in an atmosphere as on Titan to give its orange haze and Ice Tholins which form on various outer solar system icy bodies. These compounds have also been detected in interstellar dust clouds and recently by Hubble in a protoplanetary disc. There is therefore a laboratory proven and well known origin for the organics. The original experiments trying to simulate Earths early atmosphere, exposing it toUV light and high voltage electric discharges to simulate lightening, designed to see if amino acids and other prebiotic molecules could have been made, they produced a dark brown mixture of organic chemicals, surprise, surprise those Tholins again amongst them a few amino acids. The implication would be that if these organics fit the Tholins description, as their dark orange/red colour indicates, then volatile ices such as Methane, Ethane, Ammonia, Water, Carbon Dioxide, Formaldehyde, Methanol etc should be present on the comet along with silicate dust to manufacture Tholins on the comet’s surface. With no atmosphere 67P is constantly bombarded by Far UV radiation from the Sun as well as a high flux of Cosmic Radiation. The very low albedo of 67P is already a dead giveaway that this is a solar system body containing large amounts of volatile ices. The question is, and always has been, how are they distributed within the material of the comet? Yes, very thorough. Wakey-wakey little Philae, when time is due, and eat some dust. Long time no hear from Rosetta else then the usual navcam. Is it still doing its job? the first mass spectra from an instrument are typical rich with background gases, especially for instruments that are long dormant and cold. It takes time to clean the system. This may be why the first spectra are complex and then lean out. Very interesting results! Looking forward to talking with these fellows at AGU. It was supposed to get baked out as it was still docked to Rosetta and a lot of energy was present. I suspect the problems are due to the touch and go landings. I know nothing about mass spectrometry. Why this predominance of “background gases” and what is your reading of the mention of “water” in Ian Wright’s “comments” column? Does he mean H2O and if so, in what state? And what would *mainly* mean, with respect to the overall readings? Thanks for any explanations you can give! Water can be trapped and described from the metal surfaces inside the MS instrument. Water is in fact one of the dominant of the background species. The ideal would be to bakeout the MS while taking a series of measurements to establish the background levels of all species and minimize them as much as possible. In flight embodiments a compromise is always the norm though. As was seen with Curiosity, trapped gases are tricky beasties. That said, the Philae team are highly expert in just these issues and will be applying the best techniques to winkle out the data. Having read Stephan’s paper about the preparations for the use of COSAC, a very similar type of instrument to Ptolomy on Philae, it is very clear every effort has been made to validate and calibrate the instruments on Philae. This is also not the first time these instruments have been used. Both were used while Philae was attached to Rosetta during the flybys of Earth, Mars and two asteroids and from a distance another comet. For COSAC, an identical instrument, with the same Gas Chromatography columns, has been kept in a vacuum, at low temperature for the entire duration of Rosetta’s journey. This second instrument was used to validate the performance of the columns and Mass Spec on Philae’s instrument between Rosetta’s exit from hibernation and arrival at the comet. The same sorts validation processes were carried out for all the instruments at this time. These guys are not amateurs, this is a one shot mission, everything possible has been done to ensure the results obtained cannot be questioned. Thanks for your explanation, Hemo. If I understand you correctly then, the “water” reported in Ian Wright’s “comments” column of the chart was probably simply noise, as I had supposed. This was already my assumption from the fact that nowhere in the write-up itself does Ian even mention the detection of water, whereas it should have been quite a big issue if water had actually been detected just above the surface. He only ever speaks of organic compounds. Hi again Thomas. Water vapour, as well as OH- has been detected originating from most comets, including from Earth based instruments. Detecting it near the surface ought to be expected by any realistic model just based on previous remote observations. If one comet has water vapour in its coma as close to the nucleus as measurable remotely, most comets should be expected to have water vapour nearby. It is not the detection of vapour that should be doubted – it is the assumption of ice that goes with it in spite of negative detection. Differentially, the “assumption” of models that the ablation exposes what was inside the comet is a false assumption that I am challenging. You appear to agree with this assumption in that the neck must have formerly been deep within the nucleus. Also the black nature of the surface is assumed to be a result of “sintering” or “machining” whereas I think the surface has been generated and deposited on the surface with internal processes. Similarly with the generation of volatile gases. I do not think it is sublimation, or even evaporation- certainly not surface phenomena like electrical machining. I believe they are a result of internal exothermic chemical reactions and the waste reactants make their way through to the surface through pipes and chambers together with waste dust particles. You’re absolutely right. The presence of water vapour near the surface of the comet is indeed in itself not a problem for the EU model of comets, since the rock I believe they are made of can also contain a certain amount of water, just as rock does on Earth and maybe also on Mars (though that still has to be demonstrated). I simply react when the possible detection of “water” is immediately seized upon as proof that the comet is cunningly hiding vast quantities of ice beneath its black, dry, rocky, dusty surface (which also happens to be a huge 30°C warmer than the standard model expected…! This inconvenient fact seems to have been conveniently forgotten by most of the commentators on this forum who still cling to the “dirty snowball” model). I was very pleased to see the general outcry caused by the “PHILAE SETTLES IN DUST-COVERED ICE” headline to the 18/11/2014 thread, since it corresponded in no way with the actual substance of the release and what mission scientists were actually claiming. I remain similarly vigilant as regards all other types of over-interpretation. Thomas he means molecules of the chemical compound called Water, H2O. were detected. The use of the term “sniffing” implies its state when sampled was a gas. The last experiment attempted to test any solid material that had found it’s way into an oven, which may include water as ice. I imagine trying to make any sort of quick judgement on 275 samples is asking a bit much, that is going to take months to sort through that lot. The Mass Spec instrument works by vaporising all samples, ionising them. and passing them through a magnetic field, where their trajectory will deviate according to their mass and charge. A detector then measures where or when the ions hit after travelling through the magnetic field. In this case it is a time measurement and it can measure differences of nanoseconds, enough to distinguish between a Carbon 12 atom and a Carbon 13 atom, or an Oxygen 16, 17 or 18 atom. As it is sensitive enough to to separate Isotopes of atoms by one proton, it will also be able to tell the difference between Water molecules and Hydroxyl ions. As a result it can measure how much Heavy Water to normal water there is, or how much Water containing each of the three oxygen Isotopes. This is the crucial data needed to decide if Earths oceans came from comets. The news that Ptolomy has detected Water is therefore a key science objective met and by the sounds of it the instrument data is more than good enough to go a long way to answering this question, especially when you add it to all the data collected from the coma. Before others say, it could be made by electrical processes etc., I will say this result is still only circumstantial evidence for Water in the form of ice being on the comet. The atmosphere of the comet close to the surface, within a metre or so, contains Water, is what we now know. Please read Hemo Gooche’s last post again: what he *actually means* is that if Ian Wright mentions “water” in his “Comments” column, it may simply be a parasitic effect due to background noise emanating from H2O possibly present inside the instrument itself, as has recently been observed in the case of the initial Curiosity findings on Mars (incidentally a much more recent mission than Rosetta, with a vastly shorter transit time for the instruments concerned and thus, on the face of it, much less likely to be prone to this sort of scientific mishap…). This, BTW, is presumably one of the issues which explains why Hemo is “looking forward to talking with these fellows at AGU”, as he says. If Ptolomy had indeed unequivocally detected H2O molecules on or just above the surface of 67P, the news would have been trumpeted aloud and far and wide as proof of the “dirty snowball” model. Instead of which, the word “water” is not mentioned a single time in Ian Wright’s write-up…! He is clearly exerting proper scientific caution since he presumably himself has doubts about the origin of the “water” which he only mentions in his “comments”. “The Ptolemy team has lots of questions. Exactly what organic compounds are present and in what ratios? How did things change between the various sets of measurements? What does these data tell us about the composition of the 10–20 cm depth of surface dust that got kicked up during the first bounce? And what can these materials tell us about the fundamental make-up of comets? We are all clearly going to have to be patient here, as with the data provided by all the other instruments, including the crucial CONSERT data which will prove once and for all whether the comet is made of solid rock, as its appearance suggests, or whether it is virtually hollow as the announced density figure of 4g/cm3 would require. It has appeared on the official website of ESA, thus announced as “far and wide” as it is possible to do. From the post by Ian Wright and Claudia above. Curiosity’s instruments were sealed inside the landing capsule for the entire time between launch and landing. The environment inside those instruments was that of Earth’s atmosphere. The Ptolemy instrument has been exposed to over ten years of the vacuum of space and has been operated countless times over the duration of Rosetta’s flight. As I explained, a rigorous programme of validation and calibration of ALL Rosetta and Philae’s instruments has been documented and carried out, throughout the mission, just as Hemo Gooche reasoned in his post. I counted the word “Water” written six times in the written post from Ian and Claudia. At no point is there a direct quote from Ian Wright. I am sorry Thomas, but this post is just not up to your usual cogent, adversarial standard. I do agree that a necessary scientific caution is present in the above post, but it is simply due to lack of detailed analysis of the data and the often scrutinised system of releasing results. Presumptions of what other people are thinking as a basis for scientific discussion seems like “clutching at straws”. “Comets seeded” this and that from different branches of researchers are present to read by googling a bit. What soon is learned is that researchers are only trying to sell their ideas as if they where indisputable facts. Measuring the universe with instruments we built made you (not me) believe that the universe is in an accelerating expansion due to dark nonsense and some even claim that it will aslo reach a limit where time ends. (Insanity is also present amongst researchers and so is crime). Any sober mind soon realizes that the only thing that is done is research with insufficient tools and lack of understanding the far too complex behavior of nature. Any results of this mission are produced in the same manner with the same methods. Gain resources, build gadgets, collect data, analyze and guess the best you can and finally present a result that you claim is the truth. And hope this holds for as long as possible or at least as long as to get established in some position somewhere. The knowledge about our planetary system and its surrounding is not for humanity to learn as our resources and possibly our technological and political stability will not last long enough to end the story. We might get some knowledge of what this comet is all about within 4 to 6 years but thats such a small fraction of what is needed to understand what made up our planet to some part that it makes no difference at all at the end. Its been a long time since we had someone that made a difference like Einstein and his alike and it happens on daily bases that some tin-helmet researcher claims something like cold fusion or perpetuum mobile. On top of this comes bureaucratic leadership and foul play that destroys the progress of evolution and ingenuity. In sum what ESA is presenting so far is just a fun platform to build some fantasies on by amateur researchers on the blog. And this is a lot more science then some researchers at CERN did produce when they said that some of their created neutrinos did fly faster then the speed of light. Imagine that and make your neurones sparkle the best you can. no one interested in the apparent coincidence between the frequency of the comets song (40-50 mHz, published here 11./11.) and the proposed rotation speed of Philae after 16:20? Someone please explain to me why the x-axis probe continues its fluctuation (no spectrum analysis shown) after last impact. I realize that an impact would explain the slip between ROMAP and visually observed trajectory of Philae. I also realize similar frequencies may be pure chance. But no explanation to the continuous fluctuation after final impact? Those are all pure tunes, and as everything is sped up by a factor 10000 it translates to 50 mHz carrier and 1,66mHz modulator frequency which means a period of an odd 1 + 2/3 of an hour – figure that out. Hi Jacob. As I understood what Matt Taylor was saying, the charged particles in the coma interact with the Sun’s magnetic field and the motion of the comet creates a bow wave with its own magnetic field. In effect one created by the charges moving due to the Sun’s magnetic field. The amplitude and frequency of this bow wave is what we are hearing. It has some periodicity, which it seems Matt thinks could be linked to the rise and fall of cometary activity, which is itself linked to the rotation period of the comet. That seemed like a good theory that they could not quite get to match the figures. It seems you have deduced something similar. About the “pure tones”, if you read the original post, it was adjusted by a factor of ABOUT 10,000 to make it audible. I suggest that a multiplication factor was chosen to give a pure tone and make Rosetta sound “nice” rather than something just off key that would grate. @Robin, we are dealing with snippets, but still: I am curious to know 1) why the signal is composed of a constant tone of 500Hz (in the audible version) plus 1st harmonic (1000Hz) 2) why are the “clicks” spaced at a constant 16,66 Hz and 3) what causes the shift in click amplitude (what is on the AM radio?) to me this requires at least 2 resonant structures, an inductor, a capacitor a diode and a conductor + a radio host! (a modulator). I am curious to know: why 500? Why not 478? Or 513? I see no reason why someone should process the signal in a way to hit that number by multiplying by an uneven number, say, 9768 instead of 10000, but who knows really? I just don’t see the resonant structures. The release of the sound of 67P “singing” was designed to appeal to a mass audience. This is why I suggest it was made to sound “nice”. Given your analysis of the sound spectrum., your other points need explaining though. Harmonics are always significant in vibrating systems. I think though, we can take it as read that these phenomena are new to every one, if only because these measurements have not been made this close to a comet before. Harmonics are a ‘natural’ of scattering X rays on structured minerals. Carry that to magnetism. Here are a few more sound tracks in space. They all have in common electrical discharges, magnetic fields and ionization due to solar wind. It is even possible to record those whistlers on earth in far out country side areas with simple electronic amplifiers and wire antenna. Surprised that this is nothing new? Actually played as baseline by Beautyon (aka Akin) at the Golden Cafe in London 1997 with the visuals of the Pathfinder mission as backdrop. Thank you all for your in-depth blogs, Claudia, Emily and the ESA team for such fabulous work. Keep pushing that boat! great spot, I missed it, does not really sound like a coincidence. Does the comet have a tail of dust and ice? Thanks to everyone for all your hard work……. @Sandi, yes it has, it was there by the time Rosetta arrived, at from now on it will continue to grow for a year or so. The tail is what defines a comet. I believe you already answered a long time ago all the questions you are listing at the end of this post entry. No water, no ice. Apparently comets aren’t made of ice after all! I would like to point out that the term organic has different connotations. Chemistry definition: Organic molecules are molecules that contain carbon and hydrogen. I think it would be proper to include what you mean by your use of the term organic. What does the sensor detect the presence of that you are labeling organic? Thanks a lot to Ptolemy team for the very interesting news ! and the presence (as they say) of organic molecules with up to 3 Carbon atoms, I thinks that the most probables organic compound are CH4 (metane), CH3OH (Methanol), HCHO (formaldeide) + dimer and trimer (if so a clear indication of POM polimer, yet found in Halley comet), CH3CHO (acetaldeice) and HCN (cianidric acid) (able to produce glycine, the semple aminoacid). In tha case of high amount of HCN, some polieric (or better oligomeric) form is possible, together with DNA base precursors. Absolutely interesting should be the isotopic ratio C13/C13: there is some information in this ? Thanks again to Ptolemy team, waiting for similar action also from other instruments teams. Hi Logan. We have all been having issues with reCAPTHA, first going missing and then the new version working initially, then not working and now working again. Thanks for the tip, Robin. I will be careful. Starting to dream about 67P organic ‘chem-lab’ being at or near surface. Exo-biologists should start to take more seriously electro-chemistry. A belated thanks to Ian, and Claudia for this update. It gives a nice timeline of what testing was done and we can feel reassured that significant data has been obtained and have a better idea about what questions might be answered at a later point. A very basic overview of some initial findings is excellent, it gives us all here something else to pontificate upon. If we had all the answers it would be no fun.